Our product range includes a wide range of potassium titanium fluoride. Potassium titanium fluoride also known as potassium fluotitanate or potassium hexafluorotitanate is a white crystalline powder that is used as a component in fluxing & grain refining agents for Aluminium and Magnesium and in the manufacture of Titanium metal. 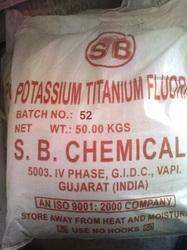 We SB Chemicals is a leading Potassium titanium fluoride manufacturer and supplier. Purity as K2TiF6 98.00 Min. Sulphate as SO4 0.20 Max. Silica as SiO2 0.40 Max. Iron as Fe 0.10 Max. Packaging Details: Packed to 25 Kg / 50 Kg / 1000 Kg in plastic woven sacks with liner. Looking for Aluminium Grain Refiners ?